An important part of network video management is security. 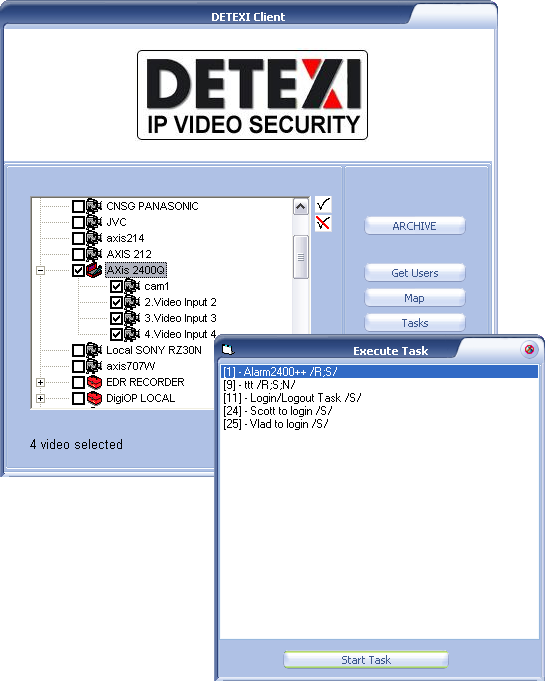 The DETEXI NVR enables the Remote DETEXI Client connection to any authorized DETEXI NVR available anywhere on the Internet or corporate network for remote viewing and control. When users connect to the NVR from the Remote DETEXI Clients, they will be required to authenticate with user settings defined in the NVR. The DETEXI NVR has the ability to provide different lists of cameras to different users, only allowing users to see and interact with the cameras they have privileges for. Different user-access levels. 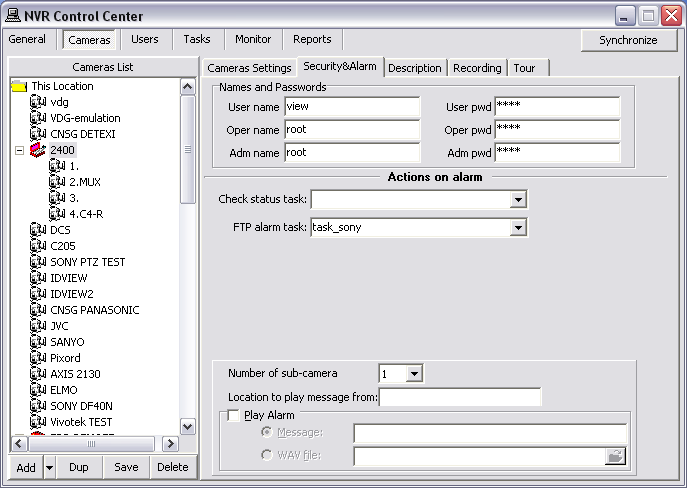 For example: administrator — access to all functionalities, operator — access to all functionalities except for certain configuration pages, viewer — access only to live video. 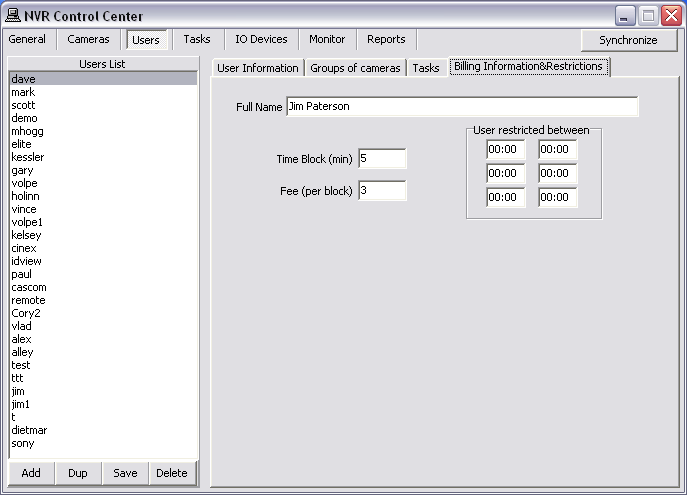 In addition, permissions such as PTZ control, maximum connection time, task control, etc. 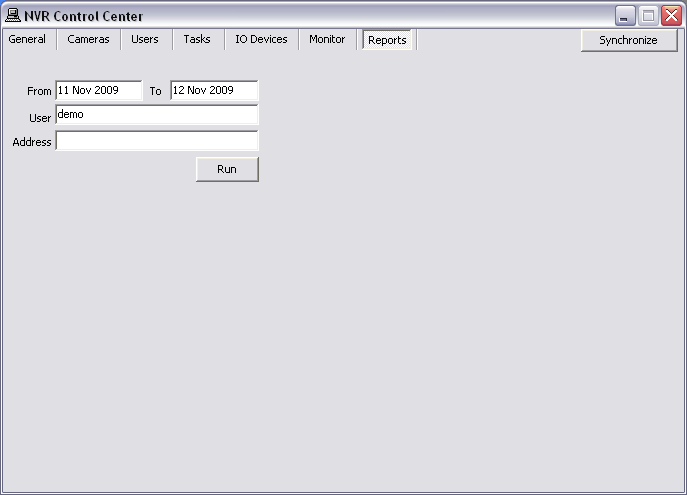 are configurable on a per-user basis. 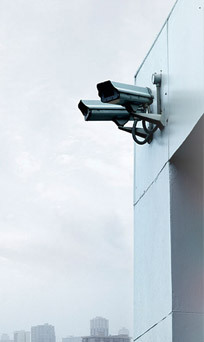 A secure communication with network cameras is created in the same way by providing some kind of identity — through a username and password to the camera and the DETEXI NVR. If authentication authorized and accepted, that is, verifying whether the device has the authority to operate as requested, the device is fully connected and operational in the system. This allows protecting the camera from an attacker who knows camera’s IP address. 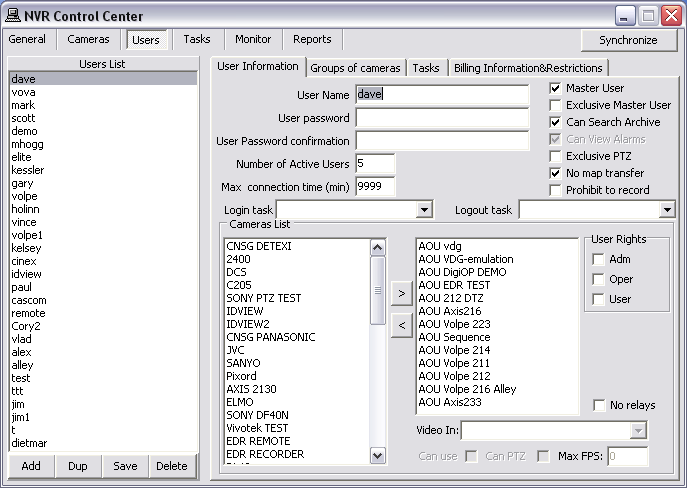 In the NVR Control Center switch to Users — User Information. Unless otherwise configured for security reasons, it is recommended to have at least 2 Number of Active Users allowed per user. In the event that a user’s session is not logged out properly, this ensures that they can log in again without intervention from a Master User or NVR Administrator. Switch to the Billing Information & Restrictions. Enter Time Block (min) and Fee (per block). Up to three restricted time intervals could be setup for a user when the user is banned to reach the NVR. Under the User Restricted Between setup each interval start and end times. 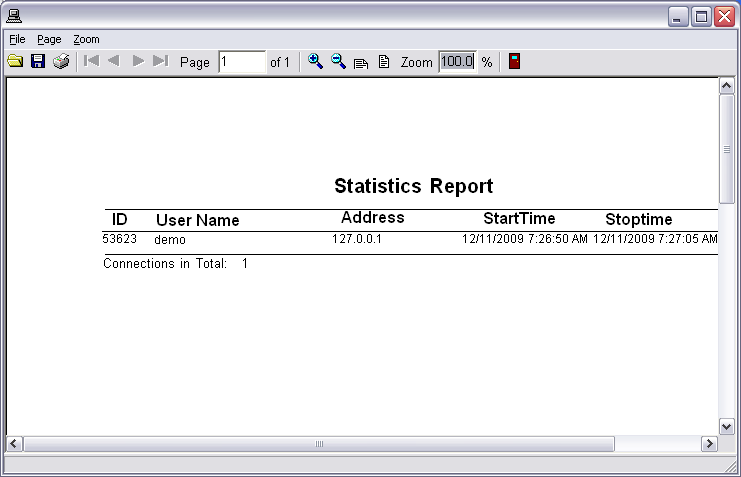 The statistic reports provide user logon information i.e. the date and time when a user has been authenticated and logged on to the NVR network and logged out as well. Monitoring this information is crucial for network administrators to track users’ activity. In the NVR Control Center — Reports. Enter the User name or host Address. Click the Run button to view/print the report. Statistic report is showing user’s activities. It is also necessary to define which of the available cameras the user has access to and also assign the level of authentication allowed from this user to the camera defined in the NVR Control Center — Cameras — Security & Alarm. With the camera selected switch to the Cameras — Security & Alarm . 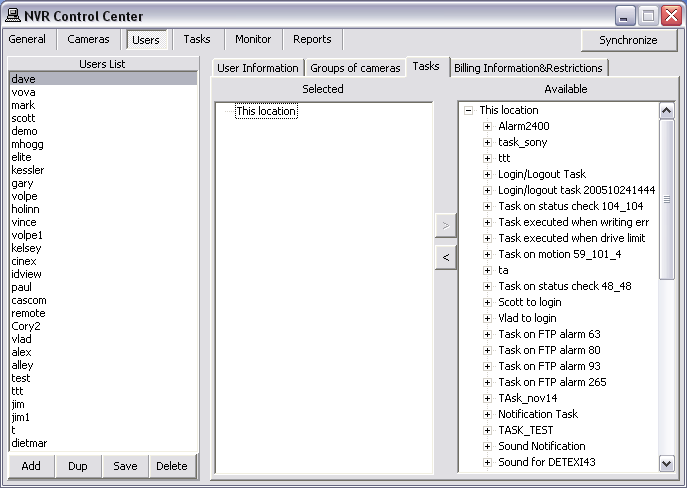 User Triggered Task (from Remote Client) — task execution can be added to user permissions, by assigning users the specific tasks they are allowed to trigger manually from the remote DETEXI Client.